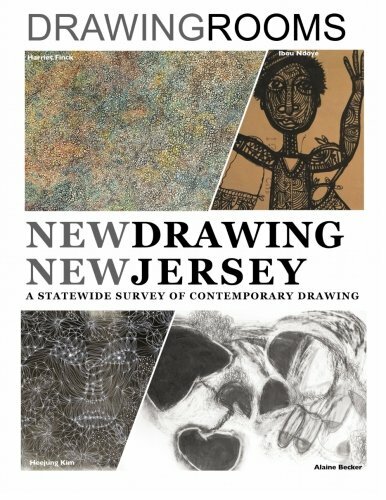 ​Drawing Rooms is very excited to present our first statewide survey of drawing. An understanding of drawing as vital to one’s development and innovation in the visual arts is at the heart of all we do. In our three years of exhibition programming, we have featured drawing, often exploring its creative relationships to painting, and have found the principles and processes of drawing in three-dimensional forms as well. As an art-space on the edge of the Jersey side of the Hudson, we have worked towards fulfilling our potential in making a place of community for New Jersey and New York artists to know each other and exhibit and work together. In presenting these NJ artists here working purely in drawing, we recognize and are proud of their accomplishments and hope to connect them to a wider audience. Artist’s themes in the exhibit explore drawing as both a conceptual and expressive process. Pat Brentano’s realistic, environmental renderings suggest she is one with nature. Ibou Ndoye’s monumental figures draw from both his African and American culture. Harriet Finck builds graphic linear marks into shimmering, iridescent patterns. Joseph Gerard Sabatino produced a chart-like, arcane writing system during a period of self-imposed isolation. Caroline Burton’s expansive grid drawings describe a three-dimensional movement in space. Biomorphic, animated beings seem to take shape and emerge from Anne Novado’ swirls of graphite. Marsha Goldberg’s delicate smoke forms document wars in the Middle East. In the energetic, chaotic works by Alaine Becker drawn line and black and white masses seem like living beings pushing against their environment. Heejung Kim’s web of transcendent pattern and radiant human shapes illuminate an invisible world.